One summer in my childhood my friend and I got obsessed with Soul Calibur 2 for the Gamecube. It was my first true experience with a 2D (style) fighting game. I’d grown up playing PC games and didn’t go to arcades much, so I never got into the older classics of the genre. But Soul Calibur 2 was an absolute blast. I gravitated towards the quicker characters, trying to string together attacks well enough to keep my opponent from being able to get any attacks in. My friend favored the heavier characters and tried to time his attacks judiciously, while using ploys like dodges and grapples to get me off balance. We never got particularly good at the game, though we figured out some more powerful attacks through trial and error and blind luck. Mostly it was your typical button smashing with some general notion of which buttons did what. I didn’t truly understand what fighting games really are until years later when I heard about the indie game Divekick which abstracts out the entire genre to only jumping and kicking, distilling everything down to the fundamental unit of outwitting your opponent through complicated timing and understanding hitboxes. There was much, much more to these games than memorizing combos and pressing buttons quickly. My understanding was more fully realized when I read David Sirlin’s book “Playing To Win”. Sirlin is a former professional fighting game player who now designs board games that frequently reference and try to evoke his experience with the competitive fighting game scene. The book is a good read and broadly applicable to any competitive gaming endeavor, but I learned from it a lot about the wide variety of strategies and intense focus that goes into playing the games well. 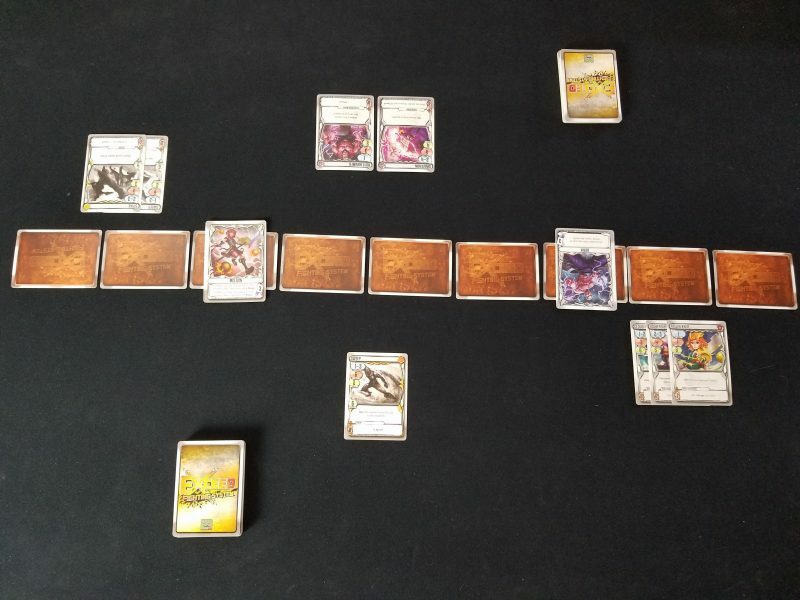 Then at PAX Unplugged this past year I was able to play the Exceed “Fighting Game System” from Brad Talton Jr. and Level99 Games, and I was blown away by how much it is able to replicate what I’ve read about the high-level strategic parts of fighting games into a card game. Within this system, which really does feel like a template for potentially near-endless variation, you work with the ideas of relative distance, attack speed, defense, blocking attacks, building up power levels, buying time, using superpowered attacks, comboing attacks, creating space for flexibility, playing with aggressiveness or cautiousness, and all kinds of other fighting game ideas. The only primary aspect it doesn’t really cover is vertical movement (no dive-kicking here), though I suspect that might have been edited out, wisely, for simplicity’s sake. Each of the small boxes retail for around $20 and come with four different fighters. 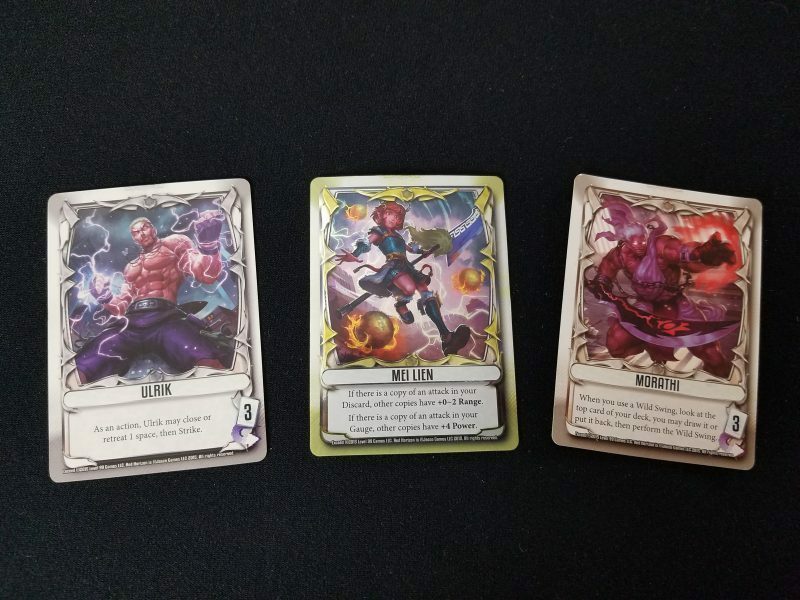 Each fighter’s deck contains about 50% unique cards and 50% generic cards shared between everyone. While some may lament the large quantities of shared cards, I think they’re important to slow down the learning curve a bit and make the game accessible to people wanting to play it casually. Just like fighting video games, Exceed looks a lot different when you know the repertoire of attacks you and your opponent have. 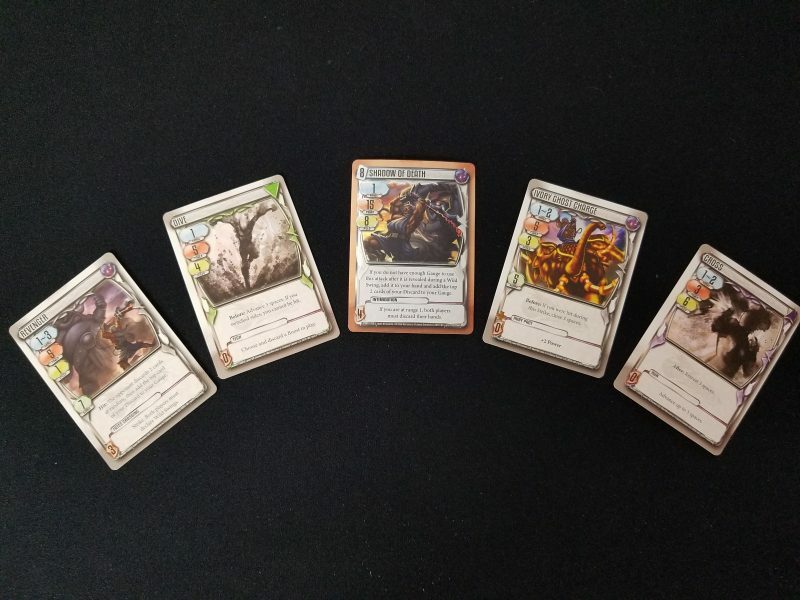 Casually you need those basic cards to give yourself a reference point for sort of what you should expect from the other player in terms of power level and styles of attacks. You need a reference point because Exceed utilizes one of my favorite game mechanisms: simultaneous reveal. The problem is that it’s such a difficult mechanism to pull off. Exceed does well. Whenever someone decides to attack as their turn both players play a card face down, either from their hand or from the top of their deck with a “wild swing”. The cards are then compared and the attack with the greater speed resolves completely. This part of the game is so critical because there can be effects that resolve before, during, and after the hit itself that might include one or both of the fighters moving. That’s important because each attack has an effective range. If your opponent is outside of that range you can’t hit them. Even more important are armor and guard. The former reduces the damage dealt by the attack and the latter establishes a threshold. If the opponent’s damage dealt exceeds that threshold, you’re stunned and your attack simply doesn’t resolve at all. Additionally, you collect power, called gauge, by landing hits. It acts as a currency for your most powerful, character-specific attacks, as well as for going into exceed mode, which flips your character card and unlocks more powerful innate abilities. Managing your gauge can be so critically important because some of the characters really rely on their exceed powers to execute their primary strategy. The differences between each of the characters really is where Exceed shines. Even with a brief glance at your character’s abilities and their unique cards you get a portrait of a truly unique and focused fighting style. I’ve only got one of the packs from the first round of releases and a promo pack with two other characters, giving me 6 to play with, and that’s plenty to offer a tantalizing mix of playing styles. One of them has a spear and can attack from a variety of distances. Another removes cards from their opponent’s deck and their own, making additional copies of those cards more powerful. There’s a ninja character that has a bunch of lightning quick attacks and movement, so they want to get in, strike quickly, and run away. And there’s so much potential here for tons of creativity from Talton in making new characters. Like I said before, it’s a template, and I’m kind of excited to see what kind of zany decks could be made with it. But if I’m going to invest in more decks and try to rope people into playing it with me a lot, I want to be more confident that there’s the potential for amazing, deep, high-level play. A 2 player game like this can be exhilarating with two people of advanced skill, but it can also falter and come short. With Exceed specifically I have two concerns. First, games like this often live and die on having a thriving metagame where people go back and forth innovating and adapting their deck constructions in response to competition. But Exceed has no deck construction. The game has to hold up as fun and engaging entirely on tactical play when both players know exactly what every card is going in. That brings up the second potential problem, which is with the simultaneous reveal aspect. It so often doesn’t work well in games because it devolves into something too basic–a game of rock, paper, scissors. That’s the death knell. There needs to be enough context around the bluffing to make the decision interesting. Consider Netrunner, my preferred 2 player card game. It’s also built around bluffing and hidden cards and the execution is perfect. With even a complete understanding of what’s in both decks every action made can hint at what’s in your hand, which can affect what actions you make in the first place. Risk/reward is a complex calculation involving the current score, the relative economic status of both players, cards on the board, cards in hand, and what kind of traps might be out there. Is there enough in Exceed to match that? Perhaps. I see a lot of potential with attack distances in particular creating some interesting scenarios. One of the characters I have is designed to stall the game as much as possible until they can land an incredibly devastating attack. The problem is that the attack can only land at a very specific distance. Playing a cat and mouse game trying to time the execution of that attack could be thrilling. Keeping track of all the cards played gives an indication of what might be in hand. Because each of the cards can be played for a secondary effect, either granting a one time action or buffing the next attack, there’s some creativity potential for using cards in unexpected and game-changing ways. And each player can only shuffle their deck once, so mill strategies are potentially viable. But as a casual player, while the discovery process of figuring out each of the decks is genuinely cool, I don’t know if there’s enough here to overcome the lack of deckbuilding to want to reach more complete levels of play. As I play it now, the rock, paper, scissors elements aren’t frustrating, but amusing. Finding out that my opponent had a monster attack I wasn’t aware of produces laughter rather than anger. Noticing all of the little fragments of design that model the experience of playing a fighting game brings a smile to my face. But every time I play I get the nagging feeling that I might be missing out on a much deeper game–that there’s a game I’m supposed to be experiencing but not. And I’m not sure if I have the motivation to find out.